As happened at the turn of the previous century, the new century has seen a massive migration of people from one country to another. Escaping oppression and war, the effects of climate change, or the lack of economic opportunity, the new migrants have often found themselves in places where they are not wanted. Called “illegals,” living in the shadows and unable to work at jobs that utilize their full abilities, undocumented immigrants and their families struggle with feelings of disillusionment, hopelessness, and fear. 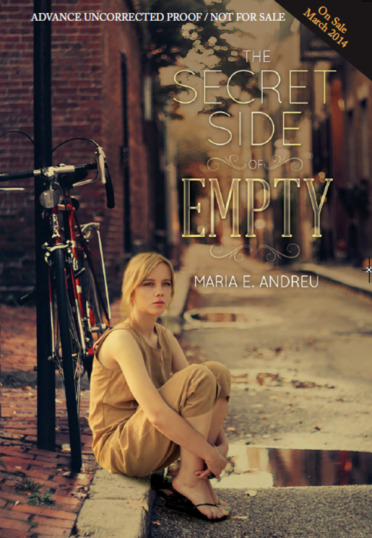 Maria E. Andreu captures these feelings in her soon-to-be-released debut novel The Secret Side of Empty, from Running Press. The story is based on her own experience of growing up as an undocumented immigrant from Spain, unable to see a future for herself as her classmates talked about college and careers. While she gained legal status and a path to citizenship through the 1986 Immigration Control and Reform Act, today’s teens, who were born in another country and entered the US illegally, are hoping that the DREAM Act will give them the same chances that Andreu had. Andreu’s protagonist, M.T. (Monserrat Thalia) was born in Argentina and arrived in the US with her parents, both high school dropouts, at the age of five as a result of that country’s economic crisis (a topic well-covered in Sarah Darer Littman’s 2010 YA novel Life, After). Now 17 years old and an academically gifted senior at a Catholic girls’ school, she cannot make plans for college like her best friend Chelsea and her other friends because she has no birth certificate, no Social Security number, no papers at all. She is also on track to be valedictorian, making her circumstances a colossal waste of drive and talent. Beneath her cheerful, competent façade are some serious problems—a frustrated, paranoid father who has turned abusive in the wake of personal disappointments and his belief that M.T. no longer respects him, financial difficulties that may get her excluded from school, a romance with an otherwise charming and kind boy who doesn’t want baggage, a bullying classmate whose brother’s suicide sends M.T’s thoughts to dark places. One of the many strengths of his novel is a cast of characters who are complex—not simply heroes and villains but flawed people trying to do the best they can in their myriad of difficult circumstances. As M.T.’s world crumbles around her, the story pulls readers in and gives them much to think about. As an undocumented teen, Andreu herself considered suicide because she saw her life after high school as a dead end. Her honest, authentic treatment of this plot thread will push readers to think about the human consequences of otherwise remote laws and policies. This intimate portrait of an undocumented family’s life, from one who’s been there, reveals both the challenges faced by and, ultimately, the resilience of people who travel to remote, unfamiliar, and often unwelcoming lands in search of a better life. Highly recommended. This review first appeared on The Pirate Tree, www.thepiratetree.com, 2/17/14. We thank The Pirate Tree for permission. This book calls for thoughtful discussion, and is ideal for illuminating and humanizing an experience that many readers understand only through media coverage and political debate.